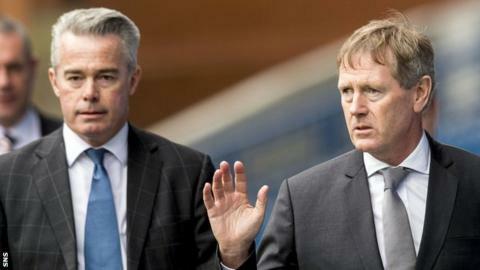 The ability of Dave King and Paul Murray to sit on the Rangers board should become clearer this week. King and Murray ousted the previous regime in March but still need Scottish Football Association approval. The SFA board, which meets this week, has been gathering information ahead of a formal application from Rangers to appoint both men. If the Ibrox club are confident those applications will succeed, they should be submitted before the weekend. King's tax convictions in South Africa, coupled with the fact he sat on the Rangers board prior to administration and subsequent liquidation, mean the SFA board must decide whether he satisfies their fit and proper guidelines. Murray, who is currently acting chairman, was also on the board prior to administration and must also have his directorial appointment ratified.